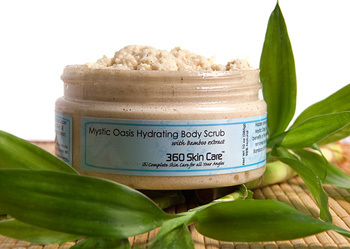 Hidden amongst a mass of dry, dreary, ordinary skin lays a majestic refuge; let 360 Skin Care’s Mystic Oasis Hydrating Body Scrub take you on journey to discover renewed skin. Unearth the benefits of the mineral enriched Bamboo extract. Bamboo gently buffs away tired aging skin and removes impurities while delicately resurfacing the skin. With the renewing properties found in Bamboo and the moisturizing power in Cocoa Butter this hydrating moisturize will leave your skin feeling refreshed and revitalized.